Heat oven to 350°F. Spray 8-inch (2-quart) square baking dish with cooking spray. In 12-inch nonstick skillet, heat 2 tablespoons of the olive oil over medium heat. Add broccoli, onion and garlic; cook 5 to 6 minutes, stirring frequently, until broccoli is crisp-tender. 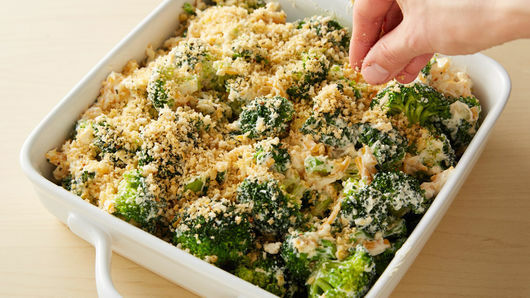 In large bowl, mix soup, sour cream, Cheddar cheese, salt, pepper and broccoli mixture; mix well, and transfer to baking dish. In small bowl, mix bread crumbs and remaining 1 tablespoon olive oil, mixing well. Sprinkle over broccoli mixture. Bake 40 to 45 minutes or until bubbly and topping is golden brown. 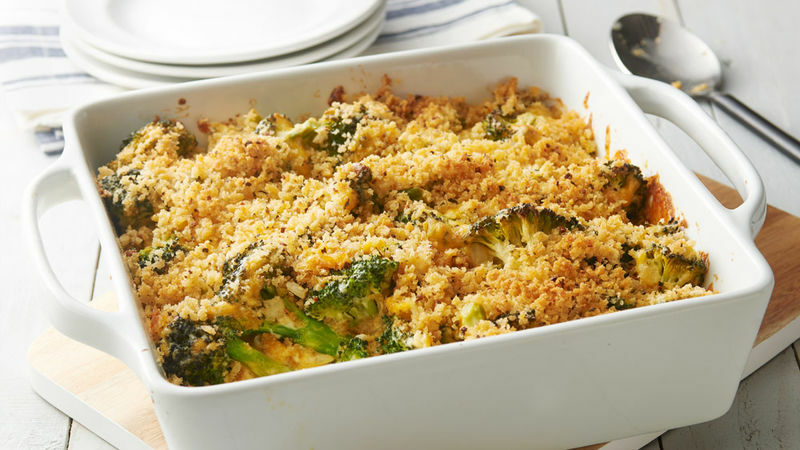 Chopped cooked bacon is a great addition to this broccoli casserole. For a little heat, add 1/4 teaspoon crushed red pepper flakes to the mix before baking.